I can't believe I haven't blogged in so long! Whew - my summer was jam packed! I was also not cooking very much. But now that my wedding is over (and I have memories to last a lifetime), I can get back into my routine. First up, how about some cookies?! I wasn't going to blog these originally because I wasn't sure how they'd taste. This is the only photo I snapped, so bear with me! They taste better than this picture looks. 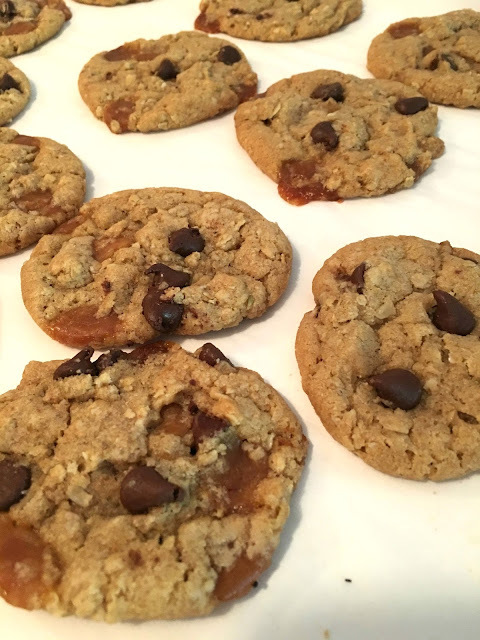 These Chewy Caramel Chocolate Chip Cookies were unbelievably good. Like, some of the best cookies I've ever made. I made them for my husband (omg, crazy to say that!) to take on his last day of work at his former employer. He started up his own business as a real estate broker this summer, but I used to send extra treats with him to his previous place of work and they loved me up there. I got rave reviews about these cookies. In particular, the crunchiness of the caramel, the meltiness of the chocolate, the unique flavor of the cookie (that'd be the browned butter). 1. In a medium saucepan, melt the butter over medium heat and whisk constantly until it just starts to brown and has a nutty scent (takes 5-10 minutes, but very worth it). Pour butter into a cool mixing bowl immediately after it starts to brown. Let cool. 2. Add the brown sugar and granulated sugar and stir until sugars are incorporated and smooth. 3. Stir in the egg, egg yolk, and vanilla. 4. Add the flour, oats, baking soda, ½ teaspoon salt, and cinnamon and mix together until just incorporated. 5. Fold in the chocolate chips and caramel bits until just incorporated. 6. Chill mixture for 1 hour. 7. Roll by hand into medium-size balls or use a scoop, and place on sheet pans. If desired, push in extra chips and bits over tops of dough mounds for a pretty appearance. 8. Preheat the oven to 325˚F, line baking sheet with Silpat or parchment paper* and bake for 14-18 minutes, or until edges just start to turn golden brown. Allow to cool for several minutes on pan, then transfer to cooling rack. *Note: caramel bits become a gooey, stuck on mess, so make sure you use parchment paper or Silpat baking mats! A Handy Guide to Meal Prepping! Questions? Comments? I'd love to hear it!